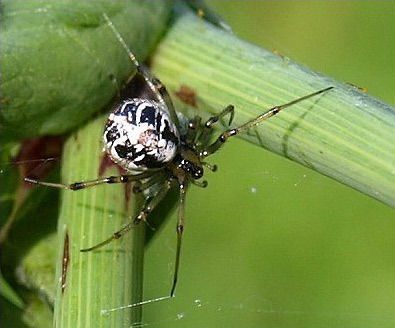 Special features: The Mothercare spider has a very rounded abdomen which has distinctive black and white markings on the back and some orange-brown streaks on the underside. 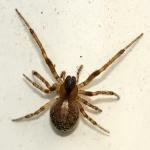 The Mothercare spider gets its name from its caring nature towards its young. The blue-green egg sac (left) is guarded by the female. When the babies hatch, the mother feeds them on regurgitated food. As they grow she shares larger food items with them. As with other species she will die before the young leave the nest and the young will eat her body. Size: Size approximately 3mm to 4mm. Months seen: Summer to Autumn. Food: Small flies and other insects.